She tosses and turns trying to get comfortable. Her hips ache and her body feels different than it used to. She hears her little one begin to fuss and leans over to pick him up from the bassinet. She feels her back tighten. She pulls him in close to nurse and feels herself struggling to sit up tall. She knows she lost her core strength over the past 10 months but truly realizes the extent of it in that moment. She wants to feel stronger. She knows her little one will only get bigger. She wonders where to start and what to do first. Run, jump and play – but not too soon after baby arrives. I have watched my partner, friends and clients struggle with loss of muscle tone, strength and core stability postpartum. Organ prolapse, diastasis and an overall weak core and low back are among the more common concerns faced by new moms. Although exercising is important, jumping into high impact exercise like crossfit, bootcamp, jogging, jumping, crunches, planks and heavy weight training too soon after having a baby could cause more trouble than they are worth. Learning a few basic exercises that you can do at home is an ideal way to get your body back on track. Caring for your newborn is a big job in and of itself but building a solid foundation and improved core stability is an important step in preparing the body for more strenuous and challenging exercises and movements in the future. Carrying a baby, giving birth and then starting the recovery process is a life changing experience; physically, emotionally and mentally. Witnessing this first hand, I saw the need for some guidance around strengthening, muscle toning, self-care and basic nutritional guidance. 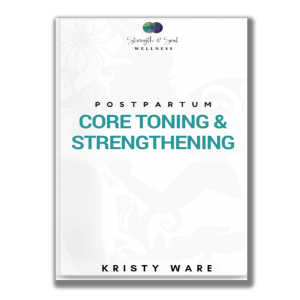 I created an ebook, CORE TONING & STRENGTHENING POSTPARTUM, that explains diastasis recti, organ prolapse and incontinence as well as what movements support women so they can strengthen the areas of their body that need it most; the low back, legs, hips and core. The very foundation of movement begins in the center of our body and your core strength sets the stage for all other activities and your ability to carry them out injury free. Your body goes through a lot to carry and birth a baby; you deal with constant hormone fluctuations, weight gain, your body expands, twists, tilts and stretches providing the best womb service available for that wee one. When your baby arrives into the world they weigh less than 10lbs (in most cases) but soon enough they will be much bigger and demanding your strength to sway them to sleep, carry, snuggle and of course hit the playground on a daily basis. Living injury free is the best way to truly enjoy life, I’m sure you agree! 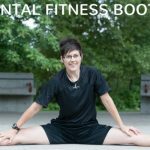 Regardless of whether you had a vaginal or caesarean birth, if you’re a new mom or your kids are older, it’s never too late to strengthen the muscles deep in the body that provide you with stability for everyday tasks, good posture and long term core strength. Taking charge of your body now, will prove beneficial for many years to come. 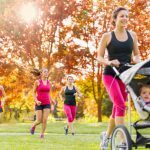 As with all new exercise regimes, be sure to get the “go ahead” from your doctor post childbirth (usually somewhere between 6-8 weeks), to ensure you’re well healed. Laying on your back with your knees bent, begin by raising your hips up off the floor towards the ceiling. Focus on keeping your hips parallel to the floor (do not let them tilt from side to side). Hold for 5-10 seconds on the up phase, come back to the starting position and repeat for 10-15 times – slow and controlled. Begin laying face down with your arms stretched overhead, head in line with the spine and legs stretched out straight behind you. Raise your arms and legs together as you cinch the muscles of your bum (glutes) and low back (erector spinae). Hold on the up phase for a 3-5 second count, lower down to the start position and repeat 10-15 times. Stand with feet slightly wider than shoulder width and toes pointed on a 45 degree angle lower your body down as if sitting onto a seat. Your knees should remain behind your toes and your weight should be primarily in your mid foot and heel. Squat down as low as you can for a count of 2 seconds on the down phase and then back up for a count of 2 seconds on the up phase. Aim for 12-20 repetitions. You will be squatting in some shape or form all your life so keep these muscles in good condition. The biggest take away here is that it’s all about having patience with your body, starting slow and building up and focusing on the small gains you make each day. I am a Fitness Trainer & Nutrition Coach with 10 years’ experience who helps busy women regain their fitness and fabulousness. I would love to help you achieve better core strength, stability and overall well-being. Do you want your belly to be toned and tighter? Do you suffer from back, hip or pelvic pain? Do you pee a little when coughing, laughing, sneezing or exercising? If you answered yes to any of the questions above, take your health and fitness one step further, and start making real progress using my “Core Toning & Strengthening Postpartum” ebook. FREE QUIZ: Which of the 7 Sacred Feminine Archetypes are you? Partial profits are donated to Out in Schools and Because I’m A Girl, as well as other charities dedicated to the environment and social justice. Flora & Kristy acknowledge that we live, work and play on the traditional and unceded territories of the Syilx Okanagan Nation in what is now known as Vernon, BC, Canada.